Britannia - meherbabatravels jimdo page! Lord Meher refers to this ship as the Britannica ( see extract below ). There is no ship by this name. The Perfect Master book mentions this ship as the Britannia on page 193.
" We left on the Britannia on April 27th ( 1933 )". The dilemma is, which of these 2 ships is the actual ship that carried the Westerners back to Europe. Presently, I've decided to include both ship entries until further confirmation. Baba kept the westerners happy throughout the journey by discussing his plans for times they would have together, leaving them no opportunity to dwell on the upcoming separation. On April 27th, they arrived in Bombay and left India the same day aboard the Britannica. Their six-month stay had ended in a fortnight. Baba left them at the docks without a glance of recognition and walked away dressed in disguise, putting on yellow sunglasses and a beret. ACCOMPANIED by the mandali, Baba proceeded to Dahanu, where he stayed for two days before returning to Nasik on May 1st. "The Goans...are known for their long seafaring tradition, making excellent cooks and stewards." 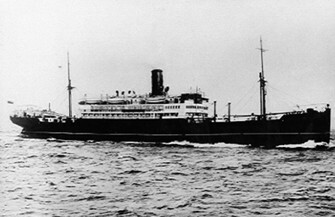 Frank West, an SS Britannia survivor. The SS Britannia, with a crew of 203 -- which includes over 60 crew members from Goa-India -- and 281 passengers, sails from Liverpool on March 11, 1941 bound for Bombay via Freetown and Durban. However, tragedy strikes SS Britannia. The ship sinks barely 14 days later. With many crew members and passengers killed, the remaining survivors jump into the damaged lifeboats in a desperate bid to remain alive. One such lifeboat -- Lifeboat Number Seven -- is damaged, has scarce food and water supply, is dangerously overcrowded with survivors of contrasting and conflicting cultures, and has to overcome nature's many hurdles -- severe heat, storms and even whales! Under such adverse conditions, the lifeboat travels across 1,500 miles in a journey spread over a perilous and incredible 23 days.